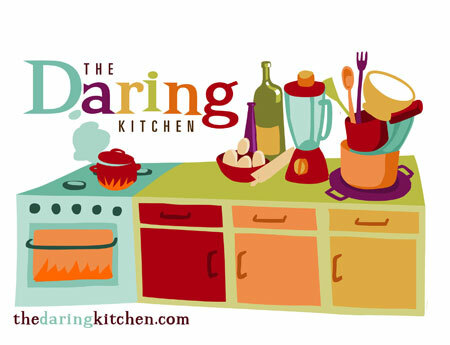 The June 2010 Daring Bakers’ challenge was hosted by Dawn of Doable and Delicious. Dawn challenged the Daring Bakers’ to make Chocolate Pavlovas and Chocolate Mascarpone Mousse. The challenge recipe is based on a recipe from the book Chocolate Epiphany by Francois Payard. We aren’t gung-ho about meringue desserts at our house, but chocolate makes everything better and mascarpone doesn’t hurt either. I decided to take this recipe as it comes and not get too fancy with flavor tweaks. My first step was to make a batch of homemade mascarpone, which I have done before. The recipe specifies pasteurized but not ultra-pasteurized heavy cream; however, I have used the ultra-pasteurized variety (sad to admit, but it is the only option at Costco) both times with no problems whatsoever. After cooking the cream with lemon juice, I transfer it to a sieve or small colander lined with several layers of dampened paper towel, and it thickens up beautifully within a few hours. Once the mascarpone was set, I made the vanilla creme anglaise, which also needed several hours to cool. My only adjustment to the recipe was halving it, as this dessert appeared to make much more mousse and mascarpone sauce than our small family could reasonably eat in one sitting, or even two. 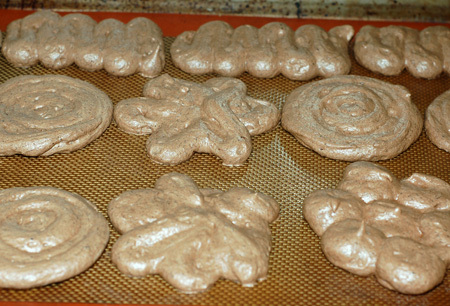 Next, I made the chocolate meringue bases for my dessert. 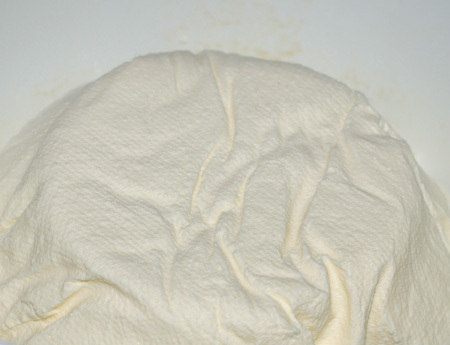 Meringues are basically just whipped egg whites and sugar; in this case, granulated sugar is beaten into the whites, and a bit of powdered sugar is folded in with cocoa powder at the end. I didn’t have any powdered sugar, so I took the liberty of making my own from organic granulated sugar. A quarter cup of granulated sugar in the spice grinder (which still smells like cloves from Christmastime… those are some potent oils!) 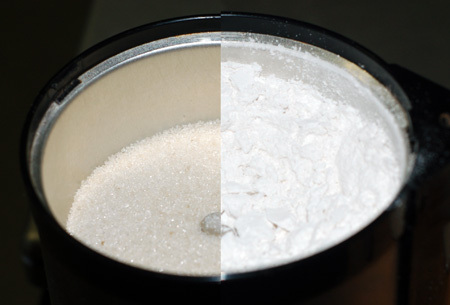 becomes nearly double that amount once it is ground into powder. Then it was just a matter of mixing up the meringue and stuffing it into a piping bag without deflating it too much. I kept my meringues simple, with some basic circles and swirls. The meringues were occupying my oven (at 175F with convection) over dinnertime, so while I was waiting on those, I made a stove-top meal for us: chicken fricassee with potatoes, and a raw Tuscan kale salad with croutons of fried bread dough. To be honest, that salad was the most exciting thing I made the whole day, and I’ll be writing more about it soon. When dinner was over and the meringue bases set, I got back to the mousse and mascarpone cream drizzle, both of which were halved for a more reasonable amount in the end. My chocolate mousse used a dark chocolate from Callebaut and omitted the citrus, since we aren’t fans of that flavor pairing; I chose to use vanilla instead. I also simplified matters for myself, and poured the cooled ganache onto my whipped cream-mascarpone fluff in the stand mixer rather than folding by hand. The beater kept the mousse nice and fluffy, and it saved me some time. I treated the mascarpone cream likewise, dumping the mascarpone in with the cream as it whipped, and then pouring the creme anglaise over the lot. 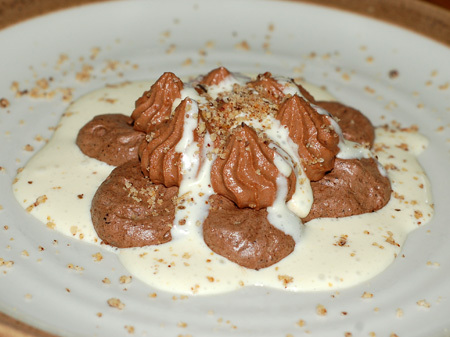 The mousse piped very nicely with a star tip. It and the meringue handled so well that I probably could have tried to get fancier with my presentation, but having been on my feet in the kitchen doing this and that for most of the day, I kept it simple so I could go have a break. I garnished my finished pavlovas with a little hazelnut praline powder and served them up. My son loved his, and made quite a chocolate mess of his face. My husband ate his, but had no interest in a second helping, and I felt the same way he did. We are still no fans of meringue desserts: This one seemed more super-sweet than chocolatey to me (and that is saying a lot, because I have quite a sweet tooth), and I kept having flashbacks to the half-quart of cream I used up in making it. The mousse was tasty, as was the mascarpone cream, although I think we would prefer the latter in ice cream form. (I’m going to try to squeeze my ice cream maker back in the freezer and give that a try, because despite halving that recipe, we still had at least a pint leftover.) All in all, it was a bit of a disappointment, and I’m not entirely sure we’ll eat up the remaining meringues. I think I would have preferred to try my hand at a more traditional Australian pavlova, with the toasted marshmallow texture and the pile of fruit on top. However, it is always fun to try out a new recipe, and this one certainly had an impressive presentation, so many thanks to our charming host, Dawn of Doable and Delicious. Gorgeous! Great job with this month’s challenge. Wow, those pavlovas look so glossy before going in the oven! Nice job on the challenge! Sorry to hear it was a bit of disappointment but at least you did try it and that is the important. Your photos are lovely and yes do try the Australian version of this challenge it is very different in texture and taste. Cheers from Audax in Sydney Australia. Thanks for the feedback, everyone! I found that we liked this dessert best when it only used two of the three components. 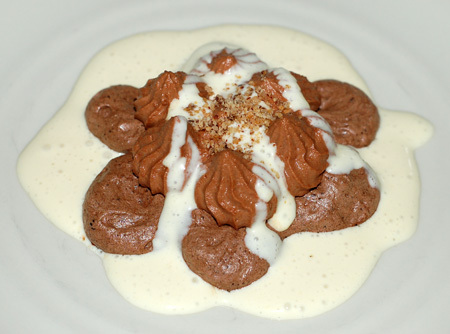 The mousse simply topped with mascarpone cream was not too sweet, and the meringues were better the next day after they had absorbed a little moisture from the mousse. I also have a strong suspicion that topping the meringues with an ice cream version of the mascarpone cream would be a hit.